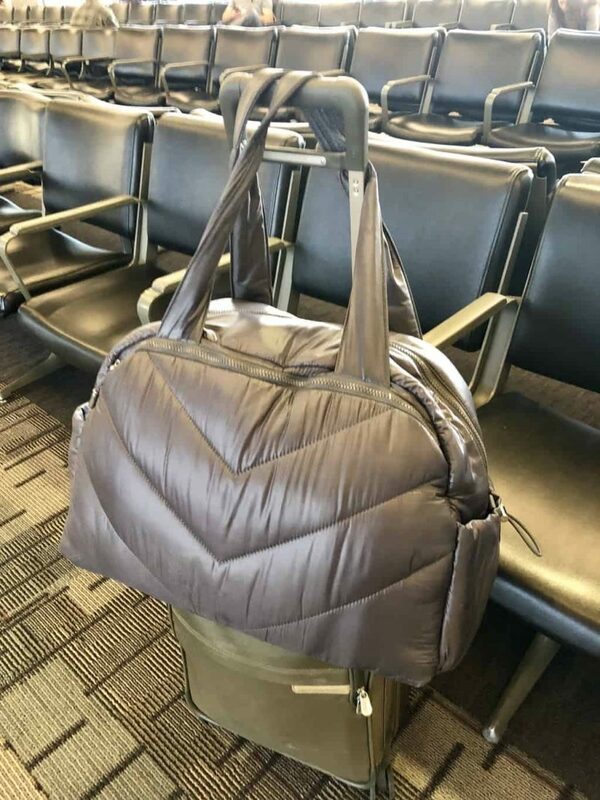 The Athleta Weekender Bag — In terms of the carry on bag itself — we absolutely love this one! It’s super lightweight, easy-to-clean and features tons of storage compartments and pockets (including a padded one for your laptop, phone charger pocket and places for water bottles and extra clothes and shoes). Can easily double as a gym bag too. 2. Bucky 40 Blinks Sleep Mask — On longer-haul flights, it’s essential you get sleep and arrive ready-to-roll at your destination. This lightweight mask has a contoured design (think pressure-free eye comfort) and has adjustable velcro straps to fit any head size. (Say goodbye to those uncomfortable elastic straps). Also comes in a variety of fun colors and patterns. 3. Water Bottle — This sleek design from our partner Athleta features a wide mouth (so you can easily add ice cubes), has grabbers (no more slipping) and keeps liquids cold for 24 hours and hot for 12 hours. It comes in white, red and black. 4. Barefoot Dreams Cozy Chic Lite Weekend Wrap — We’re pretty much obsessed with this wrap. Equally stylish and comfortable, it’s the perfect way to regulate those ever-fluctuating air cabin temps. 6. Glo Lip Barrier Balm — Along those same lines, this helps soften, smooth and condition dry lips. 7. Patchology On the Fly Treatment Kit — Contains 2 sheet masks (hydrating and illuminating) , 1 pair of eye gels and 1 hydrating lip gels. We throw this traveling beauty kit in our bag as an easy and effective way to get our skin back on track once we arrive at our hotel. 8. Compression Socks — Combat the dreaded swollen ankles/stiff legs (and other more serious complications) on that next mid-long haul flight. Fortunately you can now find them in a variety of cool colors and patterns — these are serious game-changers! 9. Packing Cubes — The clear versions are the best because they easily allow you to see what’s inside. Bring an extra change of clothes inside a larger cube (just in case your checked bag doesn’t show) and pack items you want to easily access on the plane (phone charger, headphones, lip balm, toothbrush, etc..) in a smaller size to store in the seat back pocket. Super versatile! Would love to know what would you add to this list?